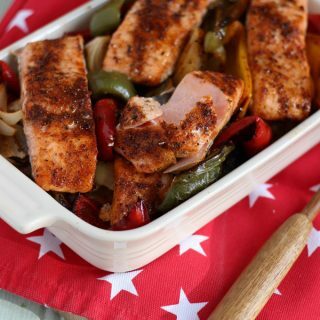 This one tray oven baked Cajun salmon, is an easy, one pan dinner, perfect for a tasty midweek meal. Complete with spiced potato wedges and vegetables. I’ve been reading this book. It’s a workbook, for business owners, to get inspired for the coming year. The book is full of prompts to help you to plan for 2017, it starts by looking back at how things went over the last 12 months. So, as it turns out, this is harder than I thought. There’s a whole section on time, with a day mapped out as a circle, and you plot off where you spend your time; work, family, cooking etc.. This has been such an eye opener for me. Seriously. Where on earth does my time go? I always feel like I’m super busy but it’s been a shocker to work out how much is wasted on, well, not much at all really. I’m probably busy wondering what to do next rather than actually doing it. So, one of my big things to focus on for 2017 is to be more intentional with my time. (Sorry, I know ‘intentional’ is all a bit buzz wordy right now, but, I just can’t help it, I’m feeling it.) For me, one of my goals for next year is no work, between 3pm and 7pm. Mainly, so I can try and spend some time with G&H after school, not feeling pulled in two directions, doing neither well. Because one of the main activities during that time is dinner, so it’s occurred to me that I really need to plan some quick dinners. Meals that I can throw together, everyone will eat (without argument hopefully) that won’t take up lots of that newly found time. Otherwise, it’s a wasted effort right? 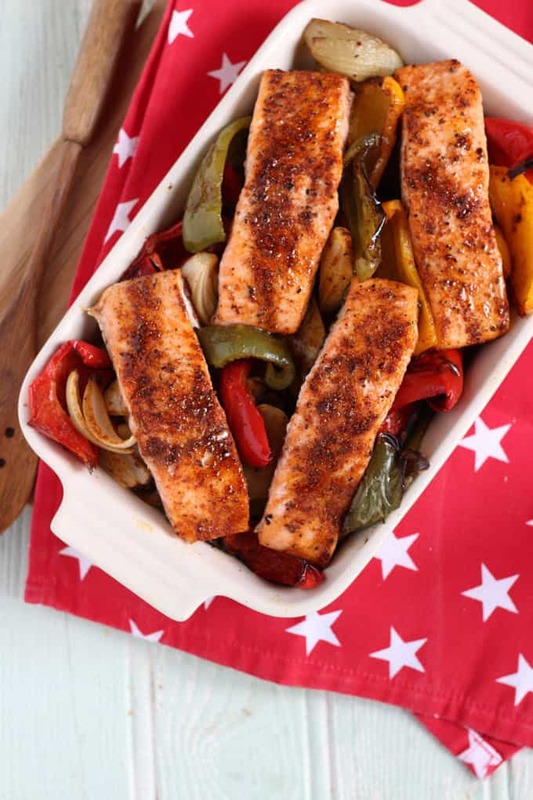 Then, right on cue, in steps this Oven Baked Cajun Salmon One Tray Throw in The Oven supper (catchy title huh?) for the second in my 7 days of salmon 7 ways with Norwegian Salmon (read here for day 1 and an intro if you missed it: Easy Peasy Homemade Salmon Fish Fingers.) Seriously though, this is the easiest and tastiest midweek meal. 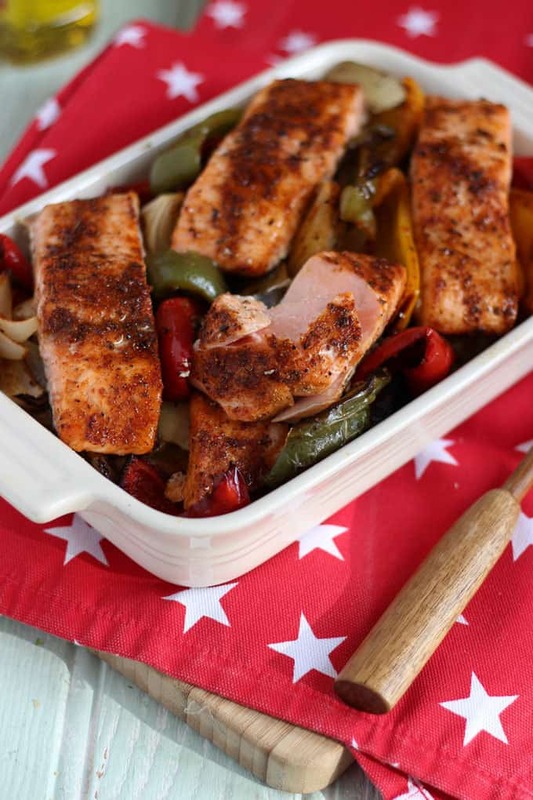 Everyone will love this Cajun salmon, with a family friendly sprinkle of spice, Norwegian salmon for Omega 3s, potato wedges, something to keep those little ones happy and oh. So. Simple. Now. What else could I do with all of this free time I’m finding?! What’s your go to quick midweek recipe? This would be delicious served with fajita style accompaniments, like sour cream and avocado. If you have any leftovers of this, it makes a super lunch the next day. Reduce the amount of Cajun spice slightly if your little ones aren’t keen on spice. 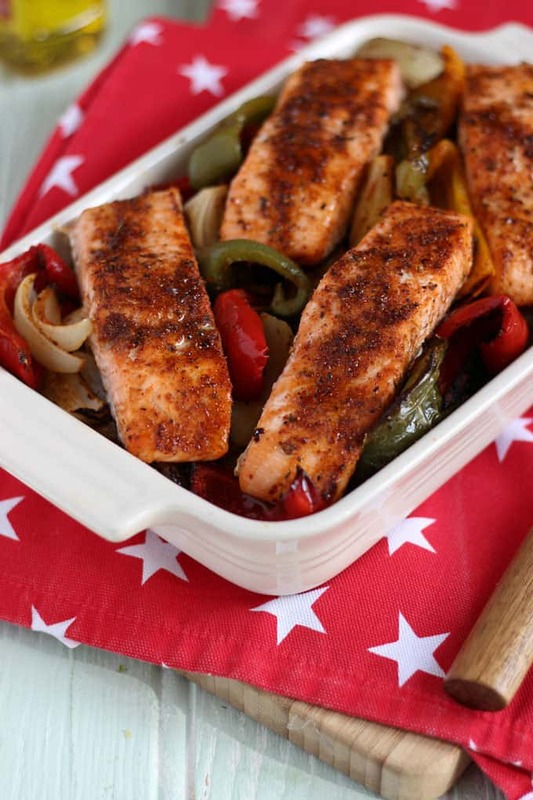 A simple baked salmon dinner dish for all the family using cajun spices. Put all ingredients into a large bowl and mix well with your hands. 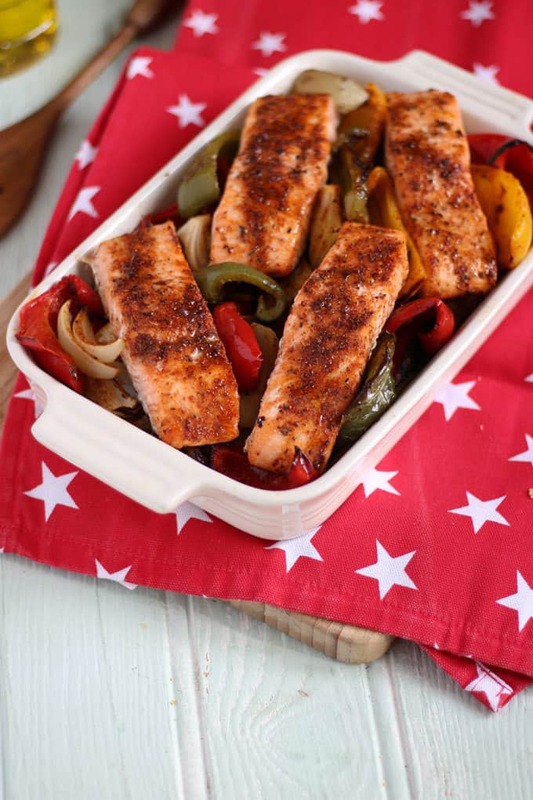 Put everything apart from the coated salmon onto a baking tray in a single layer (you may need to use two). Pop into the oven for about 30 minutes. Add the salmon on top and cook for a further 20 minutes. Wow this looks yummy! Thank you for posting this. I love salmon! Will definitely try and come back to check more of your recipes. Cheers!